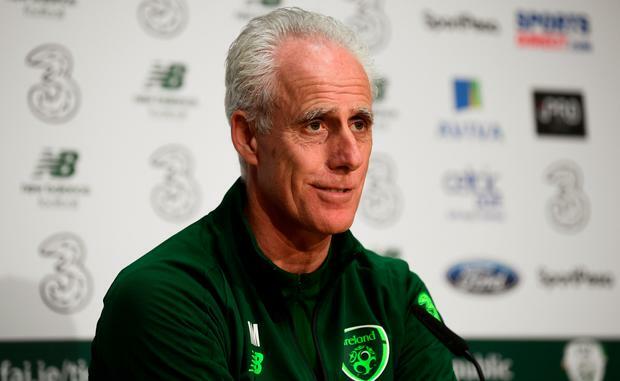 Republic of Ireland manager Mick McCarthy hopes rumours that a tennis ball protest may take place during tomorrow night's Euro 2020 qualifier with Georgia don't come to fruition. There have been reports that some fans may show their displeasure at governance issues at the FAI during the game at the Aviva Stadium. When asked about the reports this morning, McCarthy said: "I hope that's not the case, they are coming to watch a football match. They want us to win and give us a better chance and get behind us and not have outside influences affecting it. I can't affect anything about it. Maybe I'll take a tennis racket with me. "Can I just say something? Unless it's guaranteed that there is going to be one, I'm not going to talk about it anymore. We are talking about hypothetical. What am I going to say win, lose or draw, it's hypothetical. If it's brought up, I'm going to blank it. "We've come in to play a game and that's my issue, outside influences, I don't get involved with things I can't affect. This is one of them. The only thing I can affect is our preparation for the game. Then we try and pin it down and get a good performance. If we do, things willt hink a lot happier about us and have a better feeling about the team. That's all I want." John Delaney, the embattled ex-CEO of the FAI, will have to answer questions on his own salary as well as being taken to task on the FAI’s financial dealings when he faces politicians next month. A whirlwind spell for Delaney, who had been CEO of the FAI since 2005, culminated with a stunning series of events that saw him step down to take up a new role as Executive Vice-President, with immediate effect. As of this morning, the FAI’s Chief Operating Officer, Rea Walshe, has taken over as interim CEO. The association stated yesterday that Delaney would take “a substantial reduction” in his €360,000 annual salary while in his new role. But politicians are keen to grill Delaney on this, and the FAI’s finances when he faces an Oireachtas committee in two weeks’ time. Meanwhile, McCarthy has a major fitness concern ahead of the game with Georgia with Shane Duffy forced to miss training this morning. "Shane has got a sore ankle but we just left him out today. He's going to have a scan and see if there's anything serious. I'm hoping if he's ok but might not be."